Rust is caused by a number of species of fungi during humid weather affecting the leaves and stems of a great variety of plants. 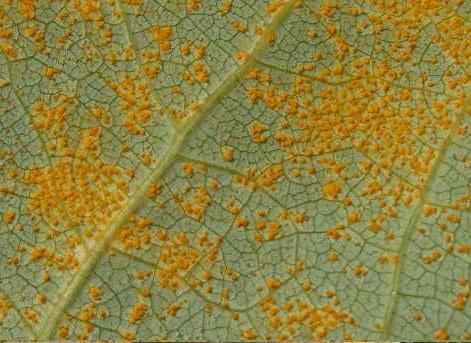 Small yellowish spots appear on the upper surface of the leaf corresponding to orange or brown pustules of spores on the lower side. 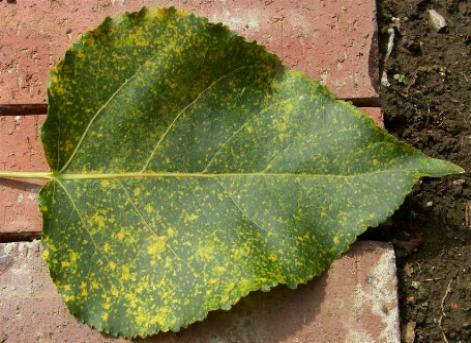 A Poplar leaf showing yellowish blotches on the upper surface. The spore-bearing pustules on the lower surface. Sometimes dark brown or black winter spores are produced. 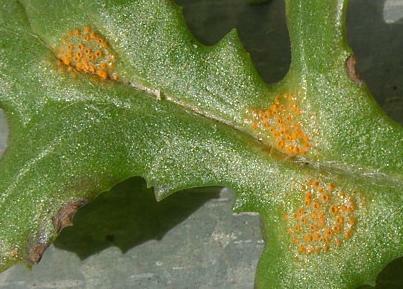 Some species of rust alternate between two hosts, eg. plum rust affects plums and anemones. On affected stems similar patches of spores appear, the stem may be distorted and die back. The spores are spread by rain splash and wind. There are two types which attack chrysanthemums, white and brown. The white rust has pale brown or pinkish pustules on the underside of the leaf and is usually fatal to the plant. Brown rust has darker pustules and responds better to treatment. Allow good air flow around plants, remove all affected material and clear up leaf debris on the ground to prevent overwintering spores carrying the disease to the next season. Plant resistant varieties of plants which are prone to attack, eg. Alcea (Hollyhock) which usually survive for two or three years after becoming infected, removing the first leaves in spring and cutting back in autumn to take away the top growth, should reduce the severity. Spray infected plants with Mancozeb, repeating every two weeks for a while. Rose rust can be sprayed with Myclobutanil.